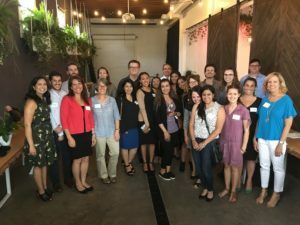 The Young Planners Group (YPG) of the San Diego Section of the American Planning Association (SDAPA) wrapped up its 7th Annual Mentorship Program last month with a Milestone Celebration at FruitCraft –Fermentery & Distillery. The Celebration provided an opportunity for the mentorship participants to come together and celebrate all their accomplishments over the course of the Program. The Mentor and Protégé of the Year Awards were also announced at the event. The awards recognize individuals who excel at their mentorship duties and stand out as a protégé or mentor. Congratulations to our winners! The Program holds multiple events in order for each group to network and learn from others. Events included project tours, Lunch & Learns, a Mid-Cycle Social, and Milestone Celebration. The Lunch & Learn, hosted at SANDAG, offered young planners an opportunity to see a planning firm in action and hear about various planning topics from planners in those fields. Complementing the Program events, many mentors planned their own events throughout the County, which they opened up to all Program participants. 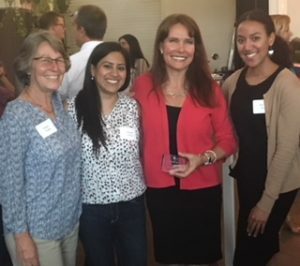 Some of these events included a walking tour of downtown Vista, site tours of the Mid-Coast Trolley Project and Padre Dam’s Advanced Water Purification Project, and a Public vs. Private panel. By meeting more people in the field, protégés and mentors alike were able to network, learn about other planning positions, and gain friendships. Thank you to all the mentorship participants for making this another successful program cycle and a special thank you to all the mentors that volunteered their time to the next generation of planners!